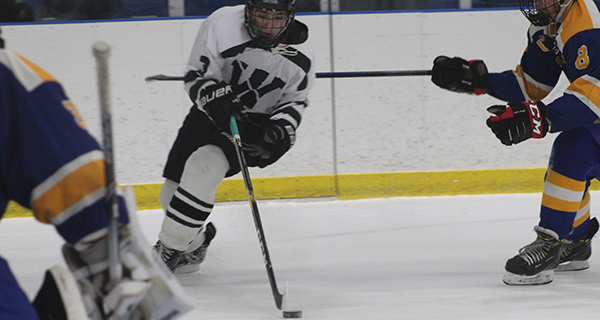 The Westwood High varsity boys hockey team entered Saturday night’s contest with Norwood still unbeaten in TVL play and looking to keep pace with Medfield (also unbeaten) in the race for the conference crown. 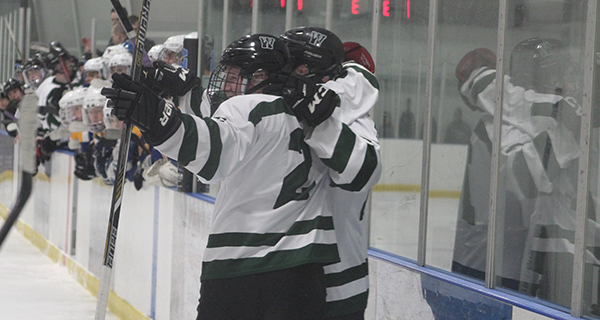 A pair of late goals by senior captain and forward Conor Donohue set Westwood up with the chance for a 2-1 comeback victory, but a late goal by Norwood with 2:43 to play forced the game to finish in a 2-2 tie. The tie helped Westwood improve to 6-1-5 overall and 4-0-5 in TVL play, but obviously, the Wolverines wanted more when up a goal with under three minutes to play. 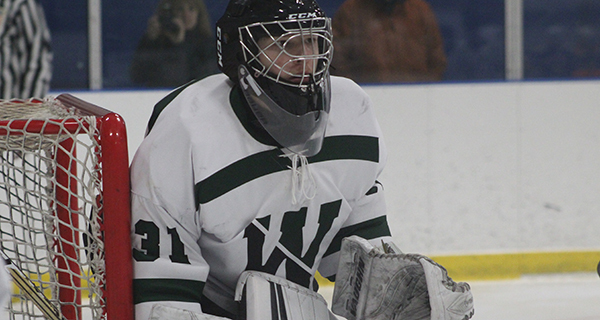 The game remained 0-0 after one period and was still scoreless with 4:53 to play in the second when Chris Martin fired home a goal from an odd angle to give the Mustangs (3-3-5, 1-2-4) a 1-0 lead at the end of two periods. At 6:23 of the third period, Donohue drew Westwood even by firing home a wrist shot on a two-on-one off of a feed from senior forward Matt Hetnik. Just 2:17 later at 8:40, Donohue crashed the net and smacked home the rebound off of a net-mouth scramble to give Westwood its first lead of the contest at 2-1. The Wolverines went into conservative mode trying to protect their one-goal lead, but a late power play opportunity for Norwood gave the Mustangs a chance to even the game. On the ensuing power play, Brandon Walsh hammered home a rebound to tie the game at two for Norwood with just 2:43 to play. Westwood nearly took back the lead with under 10 seconds to play when Ryan Healey took a feed in front but fired a backhand just wide of the far post. The game ended in the 2-2 tie. Westwood will look to stay unbeaten in TVL play when the Wolverines travel to Bellingham on February 2.